Zamberlan’s KUIU PAMIR GTX RR BOOT boot is designed for Mountain Hunters who will be spending time in high altitude terrain and are involved in technical mountain hunting. 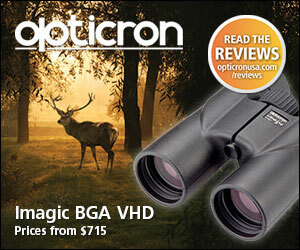 This boot is also outstanding for use in extremely steep, rough terrain or while packing heavy loads. The solid, heavy-duty mid-sole shank provides your feet with better support while reducing foot soreness. A high-end boot designed to provide outstanding traction and durability the Zamberlan KUIU Pamir has been “lasted” for a precise fit and constructed to provide maximum sensitivity and great performance. A double-tongue allows the user to customize the fit to their foot: push the tongue down and let the velcro and lace system provide a secure lower-volume fit; pull the tongue up and give yourself a higher volume fit. The insulation in the Pamir has been removed to make the boot not only lighter but to make it more breathable. Even then, the Pamir provides reasonable warmth in cold temperatures. It should be noted that the Zamberlan KUIU Pamir is not made for every hunting situation or hunter. However, if you plan on spending time hunting in steep technical terrain this should be your boot of choice for the Pamir provides you with the confidence to navigate through the roughest hunting terrain on the mountain! In working with Jason Hairston of KUIU Zamberlan continues to take the manufacturing of quality mountain boots to another level with their latest addition to its alpine boot collection, the Zamberlan KUIU Pamir. The Zamberlan KUIU Pamir features a GORE-TEX Performance Comfort waterproof breathable membrane guaranteed for waterproof protection and breathability, while the single-piece Hydrobloc infused Swiss Perwanger leather/Superfabric uppers are rugged, durable and lightweight. 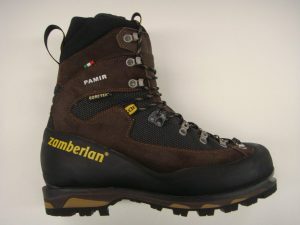 The Zamberlan KUIU Pamir features a newly designed Vibram Teton sole that works in conjunction with Zamberlan’s P.C.S. (Professional Crampon System). The Carbon Flex midsole makes the boot stiff and stable yet more flexible for hunters. The exclusive Zamberlan® R.R.S. protective rand helps prolong the life of the boot and offers improved protection for the foot. 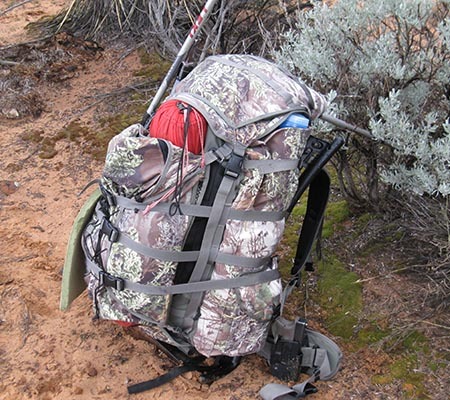 The Zamberlan KUIU Pamir was designed for only the serious Mountain Hunter! 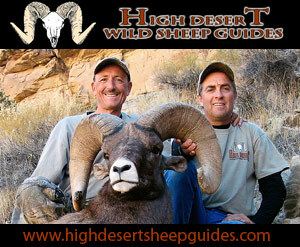 As a big game hunter, outfitter/guide for over 20 years I’ve had the opportunity to wear a lot of hunting boots. It’s no secret that Mountain Hunters demand footwear that will not breakdown in extremely rugged, difficult terrain. I’m extremely particular about the boots I wear. My personal choice of footwear could be the difference between my ultimate success or failure. Remember, you can’t hunt if your feet are too sore and blistered to climb the mountain. Quality hunting boots are at the very top of my “high priority list” in respect to the gear that I place my safety and trust in. The boots I wear had better be capable of enduring sharp rocks, mud, cactus spines, water, ice and other weapons of nature that can literally torture the human foot. I can’t afford to have bloody toenails, bone bruises or painful blisters. Having had the opportunity to begin wearing Zamberlan’s KUIU Pamir in early October I was excited to see how they would perform. Always looking for and willing to try the latest quality hunting boots being manufactured, I immediately felt lucky to have been requested to field test this particular boot. I can honestly tell you up front that it took me a few days to get used to the KUIU Pamir as the soles on this boot are very firm and stiff. However, once I became accustomed to the Pamir’s during my break in period I found that they provided me with exceptional performance. 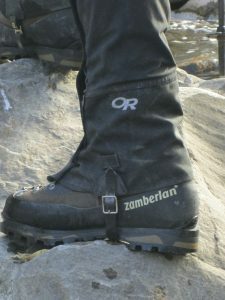 Please recognize, in my experience of ordering other Zamberlan boots, they run about ½ size larger than other boots. 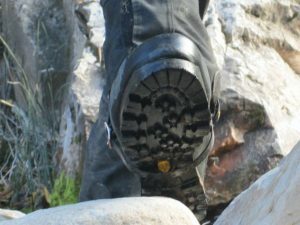 Upon receiving your boots you should conduct the Zamberlan fitting test on them before ever wearing the boots outdoors. Once the boot is worn outdoors, returns will be accepted for valid warranty issues only. The fitting instructions will be provided with the boots or you can locate them on the Zamberlan or KUIU websites. Although I was a little bit concerned about ordering a ½ size smaller I soon found out that this was the right decision as they fit my feet perfectly. After slipping the Pamir’s on I could tell that the insoles on these mountaineering boots were stiffer than the other boots I was used to and it did take a short break in period to “acclimate” my feet to such firm soles. The Pamir’ fit me really well and were definitely made for abuse! At 2.23 lbs. they may be slightly heavier than some hunting boots I’ve worn but are very comfortable and definitely provide a great deal of support and protection for my feet. The Zamberlan KUIU Pamir is designed to take all the extreme wear and tear that a high Alpine Mountain Hunter can hand out. These boots are at home in the roughest of terrain and will handle abuse at any and all levels that Mother Nature may throw at you. Zamberlan’s new technical backing provided my feet with a more precise fit. I have been impressed with how flexible the boot felt after I got used to the Zamberlan Flex GT Full Shank and Vibram Teton Soles. 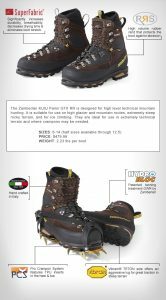 These boots are ideal for technical climbing, extreme Mountain Hunting and provide “high performance” on glaciers and mountain routes. I’ve been extremely happy with the unique and comfortable zonal lacing, pulley, and mid-boot Cam Lock system featured in the Pamir’s. The innovative double-tongue allows me as a Mountain Hunter to customize the fit to my upper ankle and leg. If I choose to push the tongue down the velcro and lacing system will provide me with a secure lower-volume fit. If I pull the tongue up, which is generally my choice, I get a higher volume fit to my upper ankle/shin. Very, very comfortable! I’ve found that the Zamberlan KUIU Pamir’s GORE-TEX Bootee construction in correlation with the Z-Thermo Comfort Fit Footbed and Zamberlan Air System allows for much better air circulation in the boot. By eliminating the Gore-Tex insulated lining this boot is lighter than other Alpine models yet it still will provide you with plenty of warmth. Zamberlan’s well conceived Vibram Teton sole has provided me with incredible traction, wear and stability. Last, but not least, of all the technical materials Zamberlan incorporated into the KUIU Pamir with input from KUIU’s Jason Hairston, the Ceramic Cordura Superfabric may be the biggest advancement. The material used on the very finest of Zamberlan’s Alpine boots will withstand the abuse of crampons and is lighter than full grain leather boots. Much of the terrain I backpack in is rugged shale, boulder covered talus slopes and steep sandstone inclines. The innovative Achilles notch in the KUIU Pamir is one feature I really appreciate. 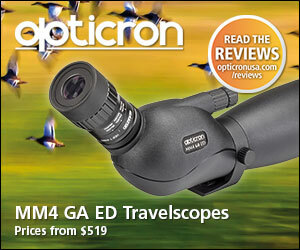 This feature alone has alleviated the pressure and strain on my tendon. The upper portion of the Pamir’s will never wear out as they have been crafted from the finest Italian leather available. The rubber-reinforced rand provides added upper protection and I have found that the partial integrated gaiter prevents any debris from entering my boot. This is outstanding, cutting edge boot innovation by the craftsmen at Zamberlan. I have no reservations in recommending the purchase of Zamberlan’s KUIU Pamir to Mountain Hunters who wish to take their expertise of exploration to another level. I do remind you that this boot was not made for all hunters or hunting situations. For those who don’t know, Zamberlan is one of the oldest and most famous boot companies. It’s no surprise that KUIU’s Jason Hairston contacted them to help craft an incredible new mountaineering boot. The KUIU Pamir has to rank at the top of the ladder with anything on the market for durability and toughness. 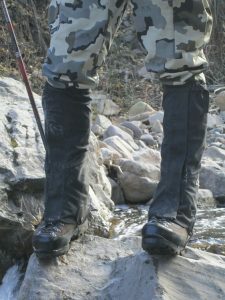 I do suggest that hunters purchasing this boot choose to utilize it in extremely rugged or high mountain terrain, as this is the kind of environment that the KUIU Pamir was designed for. Please note that Zamberlan’s KUIU Pamir’s are currently offered at $479.99 and are priced accordingly to other comparable boots. The extreme high quality and durability make these boots well worth the price. You should expect these boots to hold up under any pounding you can give them. You can depend upon the Zamberlan KUIU Pamir’s to get you on and off the mountain as they will never break down! My review would not be complete if I didn’t bring to your attention the fact that there will be some Visual Changes made to the Pamir’s from personal suggestions submitted to KUIU from Mountain Hunters. Thanks to KUIU for always appreciating personal input from their customers. As of right now please note the bulleted changes that will be incorporated into this boot. • Yellow Lacing accents will be changed to black and tan. Something that is also extremely important with any boot is the warranty and if a company stands behind their product. The Zamberlan & KUIU warranty for the Zamberlan KUIU Pamir extends for one year from retail date of purchase. They reserve the right to repair, replace or provide a credit for valid warranty issues. Again, it is very important to follow the fitting instructions provided with your purchase to assure you have the correct boot. Once this boot is worn in the outdoors, returns will be accepted for valid warranty issues only. The companies that I purchase my hunting or backpacking gear from must always be receptive to taking care of a warranty problem when I phone them personally. Zamberlan is one of the most famous and well-known boot companies noted for manufacturing outstanding footwear. KUIU is making their stamp on the Mountain Hunting world by their vision, innovation and ability to listen to the customers they serve. My only recommendation is that all high-end boot companies provide better, orthotic quality insoles.